If you want to save time on check in, our regular waiver forms can be found by clicking here, and our parental consent forms here. 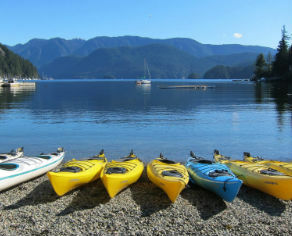 If you are looking to try kayaking in one of the most beautiful places in the world, come and rent at Deep Cove Kayak! We have one of the largest kayak rental fleets in Canada, with a diverse range of boats suitable for beginners to advanced paddlers, that can accommodate all shapes and sizes. Our knowledgeable staff can assist you with picking the right watercraft for your needs from our rental fleet which consists of plastic and fiberglass single and double kayaks as well as stand up paddleboards, surfskis, and dragon boats. You can rent for a minimum of two hours, take the whole day, or go for a multi-day rental if you want to explore further afield or camp down Indian Arm in our expedition-worthy double kayaks. If you are not sure of where you want to go, our staff can give you advice on the best places to see wildlife, scenery and where to paddle in our calm waters. We also offer Season’s Passes for either single kayaks, double kayaks, surf skis or stand up paddleboards from $495 for the season. All kayak rentals include paddle, PFD, whistle, spray skirt, bailing device and 15m of tow line, and all single kayaks have double bulkheads for safety if capsized. We highly recommend that you reserve ahead to ensure that we have the right boat available for you. Call us at 604-929-2268 to Reserve & Inquire. ALL HOURS OF OPERATION ARE WEATHER AND DAYLIGHT DEPENDENT- Please call us on 604-929-2268 prior to departure to confirm our hours. Weekdays and weekends until Thanksgiving: 10:00 am to 6pm, after Thanksgiving please call to confirm as we will be weather dependent. If you need info on what to wear or bring with you check out our What to Bring page. If you need additional info on our safety or cancellation policies, check out our Additional Info page. If you have any other questions, see if they are already answered on our FAQ page or call us at 604.929.2268. Until December 31st, 2018 all seasons passes are $50 off! Call in now to purchase your 2019 pass today! All pass holders may use a surfski seven days a week (2 hour rental), provided that they are able to successfully demonstrate a remount. All double pass holders may use one single kayak provided they are able to demonstrate a solo self-rescue to the satisfaction of our staff. All single and double pass holders may use one Stand Up Paddleboard for a two hour rental. Single Pass Holders can use single kayaks, surfskis and stand up paddleboards. Deep Cove Kayak Centre’s four Sea Kayaking Basics lessons. Including Introduction to Ocean Kayaking, Introduction to Capsize Recovery, Bracing and Edging and Solo Paddling. This four pack lesson series can be purchased for $280 plus tax (note: with a season pass you receive a 10% discount on all lessons and tours). Practice on your own and demo it to us. Contact Deep Cove Kayak Centre to set up a time to demonstrate your capsize recovery skills in front of the paddling centre. This can be done in 10 minutes and is recommended only for those paddlers competent in their solo recovery skills. Please note that the employee witnessing your refresher must be a Manager, Supervisor or Instructor. First Tuesday Night Race #3 – EVER!